It’s just another normal morning routine — getting the kids out of bed on time, making breakfast, getting everyone dressed, and – of course – the screaming, kicking, and crying that comes with brushing your kid’s teeth. You’re just not in the mood to pick that battle today and, really, what’s the harm? Think again. 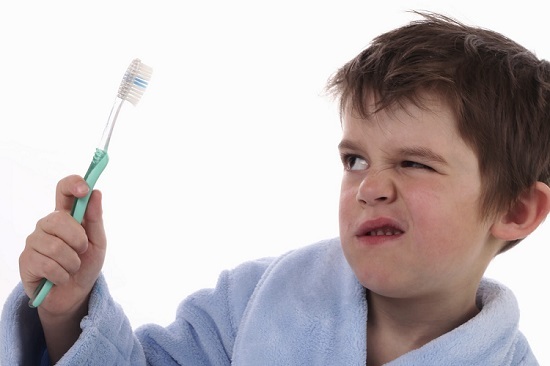 Here are 4 reasons why you shouldn’t – and can’t afford to – give in to a child who refuses to brush their teeth. 1. You can’t teach an old dog new tricks. Well, you can, but why leave it up to chance? Maybe you’re hoping that once your kids get older, they’ll adopt good oral hygiene habits on their own. It’s better to start these habits when they’re young and they’re more apt to continue them for the rest of their lives. 2. Permanent teeth can be damaged by baby teeth. If the baby tooth is decaying into the roots beneath the gum, the new permanent tooth may be resting upon the decaying baby tooth and begin decaying itself. If a baby tooth is lost to decay before a permanent tooth is ready to replace it, other baby teeth will fill the empty space and cause crowding when the permanent teeth eventually do come in. 3. Tooth decay affects a child’s education. 60-90% of school-age children currently have cavities, and over 51 million school hours are missed each year because of this tooth decay. Let’s break it down even further — in your child’s classroom of 25 kids, 15 of them have at least one cavity. Furthermore, kids aren’t always able to express their pain and discomfort accurately to their parents, so many of these cavities go untreated. 4. Poor oral hygiene leads to a slew of long-term health consequences. The mouth is often referred to as the “window to your overall health.” So if your mouth is suffering, it’s likely that it doesn’t just stop there. Among the dangers of poor oral hygiene are an increased risk of heart attack, increased risk of stroke, increased risk of dementia, severe diabetes mellitus, pregnancy complications, and respiratory disease. Don’t leave the choice up to them! After all, what child enjoys having their teeth brushed?